Among the things that you need with a Realtor whether buying or selling is an agent and real estate brokerage known for their honesty, integrity, knowledge, and superb record keeping. It is quite common for people, even a few years after their purchase or sale to be able to find transaction documents for tax purposes, warrantees, and other things. Often people misplace these items or never received them in the first place. It is invaluable to have had an agent who is not only still around and practicing, but also one who has your records on file. 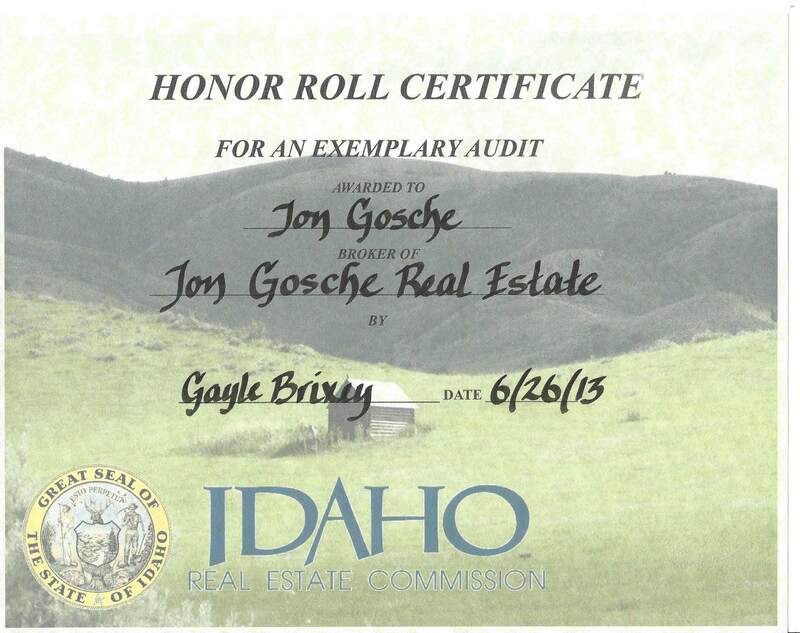 For quality assurance and assurance of honesty, proper handling of your money and other things the Idaho Real Estate Commission performs audits every two years on Idaho designated Brokers and Brokerages. The Idaho Real Estate Commission does a very thorough examination of Brokerage Trust Account and transaction records. They correct errors, require additional training, and levy, penalties and even legal action for non compliance. All of this occurs quite regularly. 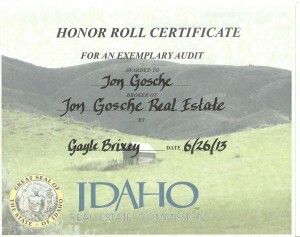 On relatively RARE occasions the Idaho Real Estate commission issues an Honor Roll Certificate for an exemplary audit. We at Jon Gosche Real Estate are proud and grateful that we have received this award several times over the past decade, most recently on 6-26-2013. This would be impossible without both exceptional broker supervision and well trained Real Estate agents who are conscientious and strive to do Real Estate right.